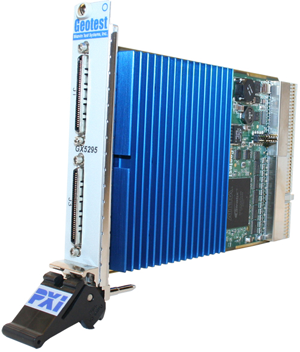 The GX5295’s pin electronic resources are independent on a per channel basis and include a full-featured PMU for DC characterization of DUTs. The PMU can operate in the force voltage / measure current or force current / measure voltage mode. In addition, the driver and receiver can be configured to support differential input and output signals from / to the UUT. A windowing method is utilized for memory accesses, which limits the required PCI memory space for each board to only 16 MB, thus preserving test system resources. A direct mode, for continuous data transfer between the test system controller and the I/O pins of the GX5295 is also supported.